The explanation of "D Bulletin" is that the article was sent to The Gray Memorial Botanical Chapter, (Division D ) of the Agassiz Association for publication in the Asa Gray Bulletin. The Agassiz Association was founded in the late 1800‘s to be an association of local chapters that would combine the like interests of individuals and organizations in the study of Nature. Eloise was a founding member of Division D and a member until her death. The text given here is ‘as typed’. Since Eloise Butler’s day, some of the scientific name classifications have changed but the old names are still searchable. Where there is a significant spelling difference that would prevent identification I have added within brackets [ ] either a correction, missing letter, etc. In several places in the original there are pencil notations that are indecipherable. Those plants that are still extant in the Garden, or until recently extant, have a link to a plant identification sheet, with photos. PDF copy of original typed paper. Following the Butler text is a plan map of the Wild Botanic Garden in 1912 with features named by Eloise Butler annotated. A set of editor's notes about the pool and its location is linked to a detailed reference article that provides additional information on the location of the pool and when and why it was abandoned. Some additional texts of Eloise Butler that were found in separate articles but associated with the Mallard Pool text is then appended to the bottom of the page. 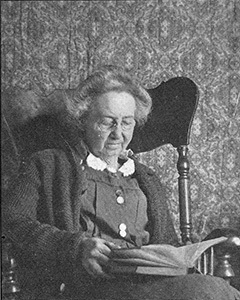 Eloise Butler around age 80 near the time she wrote this article. Ever since the Native Plant Preserve [Eloise's word] was started I have wished to have a pool constructed where two small streams converge in an open meadow, the only pool in the Preserve being too shady for aquatics. The hard times gave this joy to me, for a jobless expert did the work for a sum that could be afforded by the Park Commissioners. The pool is about 35 feet long, several feet narrower, and of irregular outline. Indeed, the contour is beautiful. The excavation was made in a dense growth of cat-tails. While digging, the workman saw a mallard duck wending its way through the meadow with a train of four little ones. Hence the name of the pool, as this duck had never been listed before in the Garden. The voracious muskrat was also observed, and I began to fear that the roots of my water lilies would be gobbled up. It was thought that stout wire netting at the top and bottom of the pool would prevent the muskrats from entering, but my adviser knew little of their predatory habits. Some white water lilies were planted in the pool. In two days only a fragment of the leaves could be found. Then it was decided to encircle the pool with the netting sinking it two feet in the ground. Before this work was completed, a muskrat preempted the pool with two little ones. We thought we could trap them inside and throw them over the fence but before the circuit was complete, they left on their own accord, probably in search of more food, and the gap was closed against them. It is possible that they will burrow under the fence. Traps must be set next spring. Eloise Butler overlooking the Mallard Pool after its construction. Photo courtesy of Minnesota Historical Society. A rustic fence of unpeeled tamarack poles has been built across the narrow lower end of the pool. Here one at advantage the pool and the border [sic - as written]. Opposite at the upper end, is “The Gurgler”, the water entering gently by a short series of low rapids. Here my ingenious bridge-builder will insert a water-wheel made of galvanized tin and about five inches in diameter, designed to throw a mist-like spray over plants like Pinguicula that flourish on dripping rock. We call the place Atlantic City because, at each end of the bridge, a plank walk was laid over the cat-tail slough. Many desirable plants were already established near or on the border of the pool: Sagittaria latifolia, Eupatorium maculatum, E. perforatum, Verbena hastata, Epilobium coloratum, Lythrum salicaria, Mentha canadensis, Rumex brittanica [britannica], Solidago canadensis, S. uliginosa, Aster puniceus, A. juncea [junceus], A. umbellatus, A. paniculatus, Asclepias incarnata, Helianthus tuberosus, H. grosseserratus, Rudbeckia laciniata, Chelone glabra, Gallium asprellum, Caltha palustris, Impatiens biflora, Aspidium thelypteris, [pencil addition] Onoclea sensibilis, and an overplus like water cress and cat-tail, and others that must be grubbed out with ruthless hand like Cuscuta gronovii and Bidens cernua. In the near vicinity are the grandest species of our flora - - Cypripedium hirsutum, C. parviflorum, C. pubescens, C. candidum, and far enough distant not to shade the pool Cornus stolonifera, C. paniculata, Viburum lentago, V. opulus, and a few tamaracks. The soil is a rich peaty loam. Here and there on the border this was mixed with a due proportion of sand to accommodate the plants that will not grow except in wet sand. Large sods of sand-lovers have been contributed by friends of the garden -- packed full of Polygala sanguinea, P. cruciata, Viola lanceolata, V. sagittata, V. arenaria [pencil notation], Eriocaulon articulatum, Gratiola aurea, Steironema quadrifolium, Kyris [Xyris] flexuosa, Hypericum canadense. In lesser amount have also been planted Pogonia ophioglossoides, Calopogon pulchellus, Lilium superbum, L. umbellatum, Geradia tenuifolia, Spiranthes gracilis, S. romanzoffiana, Drosera rotundifolia, Spiraea tomentosa, Mimulus ringens, M. jamesii, Gerardia tenuifolia, Sagittaria heterophylla, Cyperus strigosus, Calla palustris, Parnassia caroliniana, C. palustris [repeated listing], Veronica americana, Primula farinosa, P. mistassinica, Saxifraga aizoon, Pinguicula vulgaris, Gentiana andrewsii, Aster novae-angliae, A. modestus, Lysimachia terrestris, Viola incognita, Boltonia asteroides, Veronia fasciculata, Helenium autumnale, Hydrocotyle americana, Comandra livida [lividum], Solidago ridellii, Astragalus canadensis, Helianthus hirsutus, Habenaria ciliaris, H. blephariglottis (the last two a contribution from Mr. Lownes), several clumps of Lobelia siphilitica and L. cardinalis, sowed seeds of Cassia chamaecrista, Crotalaria sagittalis and Strophostyles helvola, also Collinsia verna. This may seem too large a number of plants for a border, but the border is of indefinite width. It comprises nearly an acre and extends across the sunlit area of the marsh. I shall probably think of more desirable plants! 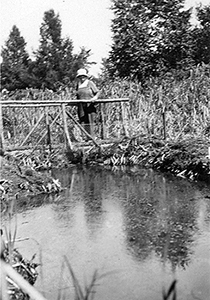 Detail of Eloise and the rustic bridge of tamarack poles. Note the wire netting used to keep muskrats out. The small pool is another proposition. Its size will not admit more than one or two specimens of all the species that I wish. I have already planted therein Castalia tuberosa [pencil change - see note below], Nelumbo lutea, Pontedera cordata. I shall also introduce when I can get them -- next spring if not this fall -- Nymphaea advena, N. microphylla, Prasenia schreberi, Lymphoides lacunosum [??? not identified], Ranunculus aquatilis var. caillaceus, R. delphinifolius, Lobelia dortmanna, Hippuris vulgaris, Sparganium simplex. I should have written above Castalia odorata, instead of tuberosa, the latter is not a free bloomer and spreads too rapidly. any member of the chapter will confer a great favor by telling me where I can get the Nymphoides which is not listed by florists. I find that I have omitted from the margin, Osmunda regalis, Liatris pycnostachya, Physostegia virginiana, Decodon verticillatus, Zygadenum chloranthus, [next garbled - assume - Tofleldia pursilla], Tanacetum huronense, Lobelia Kalmii, Hypericum ascyron, Prenanthes racemosa, Gentiana andrewsii, Hibiscus militaris, Stachys palustris, Habenaria psycodes, H. fimbriata, Myosotis scorpoides, Lysimachia quadrifolia, Lythrum alatum, Chelone obliqua, Saururus cernuus, Alisma plantago, Lilium canadense, Melanthium virginicum, Spriraea salicifolia, Iris versicolor, Pedicularis lanceolata. I intend the fence barring out the muskrats to be concealed by the tall herbaceous perennials. The little water wheel (to be removed during the winter lest the paddles be bent by ice) has been inserted in “The Gurgler,” but the name has been changed to “The Jolly Spindrift.” It chugs around so merrily, the spray splashing in the sunlight, that everyone smiles audibly when he sees it. I gave it the name a first sight, to find afterward that it is a new coinage, the compound not being in the dictionary. Below the rustic bridge another excavation has been made, continuous with the first, but more like a little pond, while the first is like a winding river emptying into it, increasing the length of the water area to fifty feet. I needed the “pond” for the display of the aquatic buttercup -- white and yellow -- which I hope the muskrats will find too bitter to eat. Otherwise, the pond must be fenced. Some yews, “ground hemlock”, have just been contributed to the border, whose bright green foliage will greatly add to the toute ensemble. Gratiola continued to blossom for some time after planting and marsh marigold began to bloom for the second time on the border. Even now, at the beginning of work, the place with its setting is truly enchanting and I have to tear myself away from it. I shall dream of it all winter and conjure up the futurity of the plantings. Common Name List - Scientific Name List. The Mallard Pool was abandoned in the late 1930s. Details on where it was located and when and why it was abandoned are in this pdf file: The Mallard Pool. 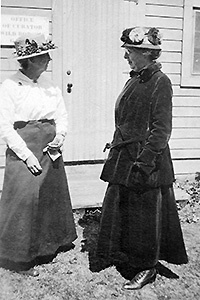 Above: Eloise Butler with Clara Leavitt (right) in from the of the Garden office. Photo courtesy Minneapolis Central Library, Minneapolis Collection. Additional notes of Eloise Butler appended here for lack of any particular document she referenced. At Miss Leavitt’s request, I will add an account of one of the many vagaries in wild gardening: Are you all familiar with Prairie Dock, Silphium terebinthinaceum, belonging to the same genus as the famous Compass Plant, S. laciniatum? It is a native of Minnesota, but is not found near Minneapolis. A single specimen was given me nine years ago and I planted it near my office. Every season it sent up its large green banners, but nary a flower. I hesitated to change the plant to another situation because of its large root and lest I might lose it altogether. So this last spring I gave it a good talking to and bought half a dozen more Prairie Dock and planted them elsewhere. To my astonishment the obstinate specimen sent up at once the tall stalk that burgeoned out into a number of sizable yellow flowers! I have had somewhat similar experiences. Does it mean that plants are sentient beings? The Boston Herald of July 31 prints an illustrated account of two freak dandelions growing in a yard in Weston, Massachusetts. One is nine foot in height and the other six feet. Both are in the budding stage, so they will attain still greater heights. The nine foot dandelion had a stalk one inch in diameter. Both had leaves eight to ten inches in length. Why did you take the course in Botany? What benefit, if any, have you derived from the study? What part of the subject do you like best? “I have gained the habit of keeping my eyes open, to notice the different plants and changes in nature. In keeping my eyes open for nature, I have become unconsciously more sharp or bright in my other lessons. I really have found this to be true. I like the part of Botany where we study how closely plants and animals are related in their work for each other.” Florence McDonnel. The photo at the top of the page is a collage of Eloise Butler at 4 stages in her life: A young woman, ca. 1890, Garden Curator 1910-20, mid 1920s and age 80 at her birthday party, Aug. 2, 1931. Photos courtesy Minneapolis Public Library, Minneapolis Collection, and Minnesota Historical Society. 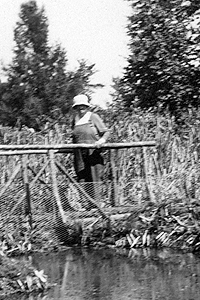 The Wild Botanic Garden in Wirth Park, became the "Native Plant Reserve" and was then renamed the Eloise Butler Wild Flower Garden in 1929. This first part of the Butler essay, the section at the top of the page, was published as explained in the prologue.